Join Pakistan Navy as Civilian, Pakistan Navy has announced New Jobs in Daily Express Newspaper 04 March 2018. Candidates who have Required Qualification and Experience may apply for Pakistan Navy Jobs 2018. Intending Candidates may apply by online registration by www.joinpaknavy.gov.pk. However for Serial No 13, 14 and 15 online registration facility is not available. They are advised to send their application to Officer In-charge Pakistan Navy Recruitment and Selection center House no 02, airport link road alfazal town Rawalpindi. 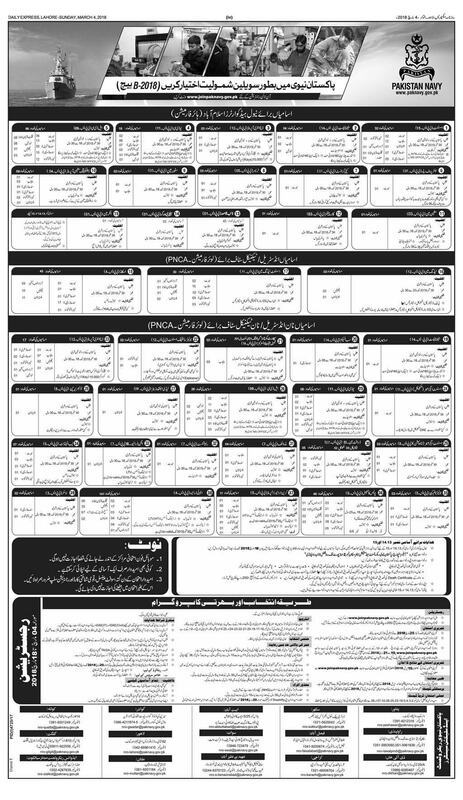 Vacant Situation in different wings of Pakistan Navy is as follow, for Naval Headquarter Islamabad, Assistant, Steno typist, Data Entry Operator, UDC, LDC, Senior Proof Reader, Calligraphist, Tracer, Store Man, Duplicating Machine Operator, Machine Man, Carpenter, Naib Qasid, Sanitary Worker, and Inker Man. Positions for Industrial/Technical Staff for Lower Formation and Positions for Non Industrial/Non-Technical Staff for Lower Formation Departments are also Included. Further Candidates are directed to Visit Pakistan Navy Website for more Details and Description. Written Test and Further Recruitment Process will be Held in All Recruitment Centers of Pakistan Navy located at different Cities of Pakistan.